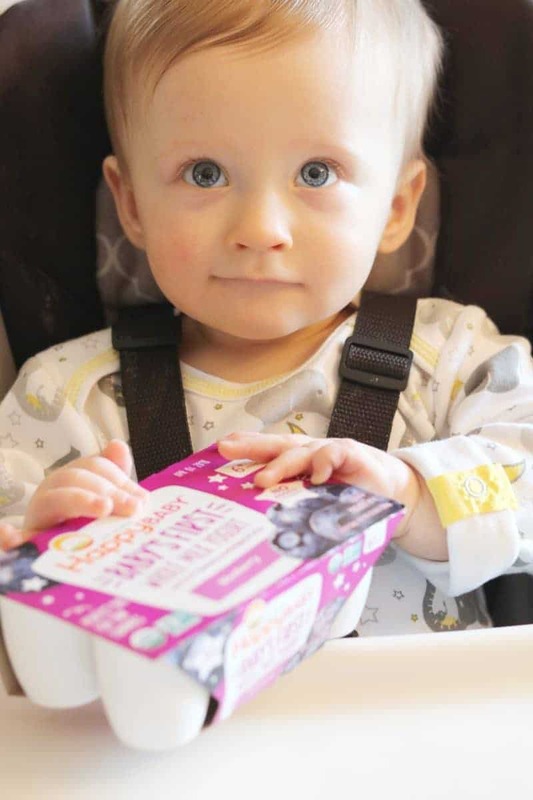 Did you know that you can feed baby infant yogurt from as young as 6 months? 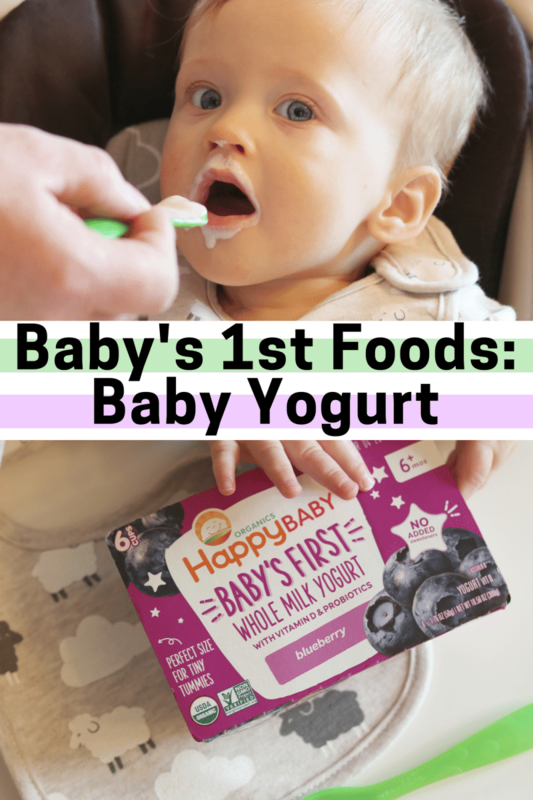 Find out all about baby yogurt and my experience feeding my son baby yogurt for the first time. … but we were wrong! While it is true that infants should not have cow's milk on its own during their first year, baby yogurt is perfectly safe for them. In fact, baby yogurt is made especially with infants in mind. Don't worry, I was confused too! 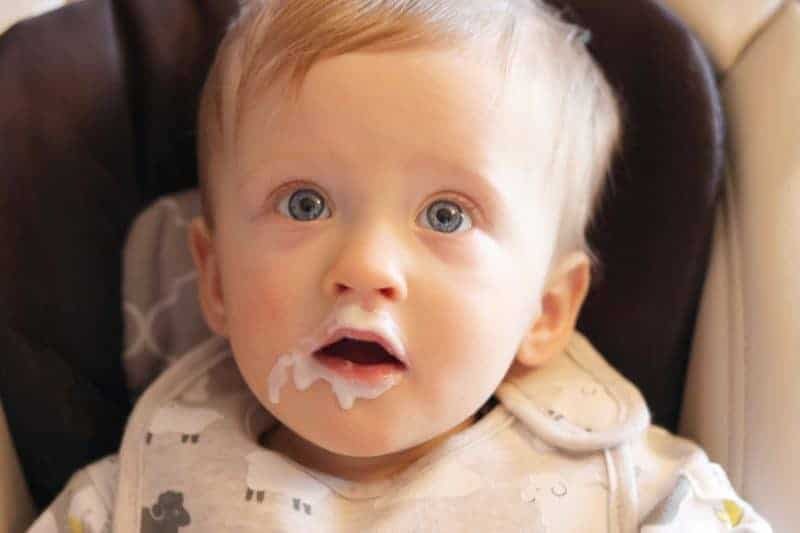 Today I want to share what I learned about baby yogurt as well as our experience feeding our son yogurt for the first time. Why is it alright to give a baby yogurt but not whole milk? Simply put, yogurt is easier for babies to digest. In yogurt, the lactose and milk proteins are broken down making them easier for baby's little tummy to digest. When can you give baby yogurt? Typically you can introduce yogurt into your little one's diet as soon as you start baby on solids at 6 months. 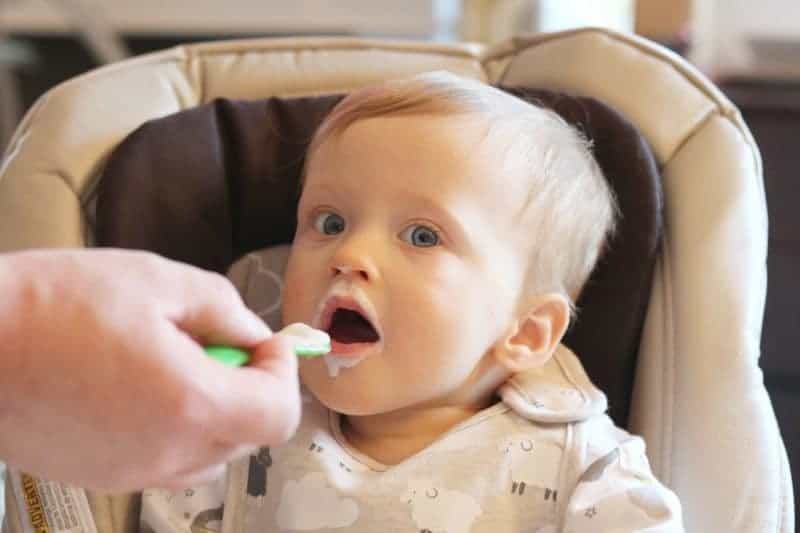 As always, you should speak with your pediatrician before starting your infant on yogurt or on solid foods in general. What is the best baby yogurt? After looking into different brands of infant yogurt we decided to start our son with HappyBaby Baby’s First Whole Milk Yogurt. Basically, HappyBaby yogurt checked off everything that we were looking for in an infant yogurt. It is USDA organic certified, non-GMO, and made with whole milk and without any added sweeteners. Our son was excited to see something new on his highchair tray that he would get to try. After investigating the package a bit, we opened it up and began to feed him. As you can see, baby approved. He loved his HappyBaby yogurt and couldn't get enough. When he finished the cup of yogurt he gave me his “I want more of that stuff!” look. It was awesome! I am very happy to have found a new food to add to our baby's rotation. 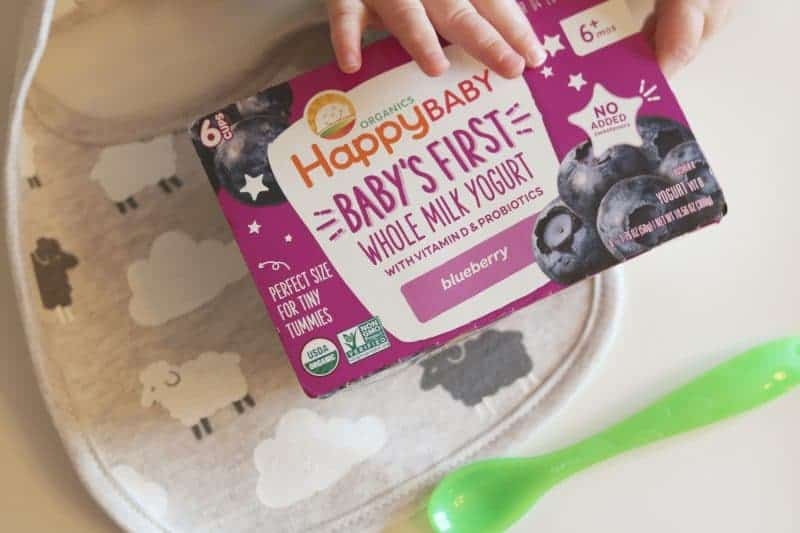 Since I started off with only one variety of HappyBaby yogurt (blueberry) I am planning to pick up additional flavors on my next trip to the grocery store. I am excited to see what the little guy thinks of them all. I love having lots of new flavors for him to try. Where can you get HappyBaby Baby’s First Whole Milk Yogurt? HappyBaby products are available at retailers nationwide. Be sure to download and print out this valuable HappyBaby coupon to save money when you pick up HappyBaby for your little one. 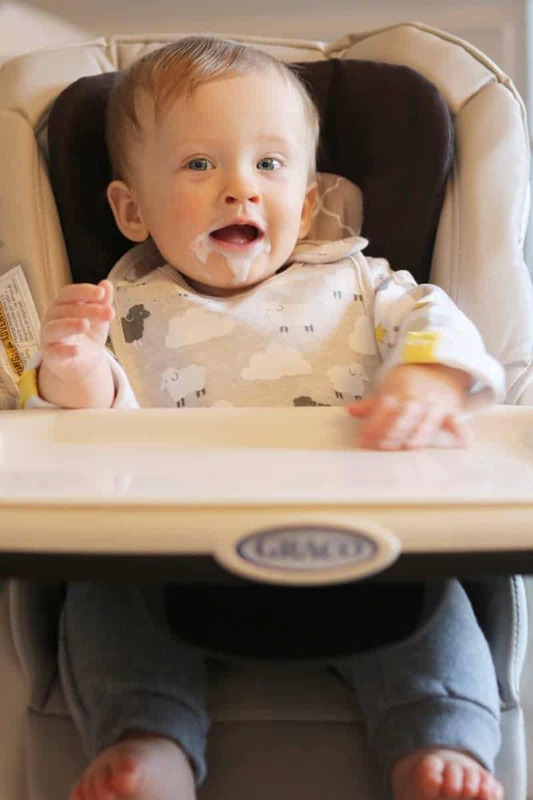 I would love to hear how your baby liked their HappyBaby yogurt in the comments below! Interesting, I didn’t know that an infant could have yogurt, either. My grandson just turned 6 mths, I bet he would love this. I’m still a little scared, his dad was extremely allergic to milk when he was young.